Perhaps you think there aren’t enough Delsey Luggage review articles out there; we were thinking the same thing and so we took a harder look at one of Delsey’s fan-favorite suitcases, their Sky Max Expandable Spinner. This is a lightweight soft-shell suitcase, and what that should mean (as far as market value goes) is that this suitcase will be lighter than a hard side bag that uses ABS materials or polycarbonate, yet hopefully still quite durable. Soft shell suitcases have become more and more popular on the market, especially where the Delsey brand and its design team are concerned; if you’re in the market for a lightweight, hassle free suitcase, typically you can rely on the Delsey brand to deliver. But don’t just take our word for it, keep reading for our close up inspection of the Sky Max Expandable Spinner, and lets see if its worthy of being your newest suitcase. 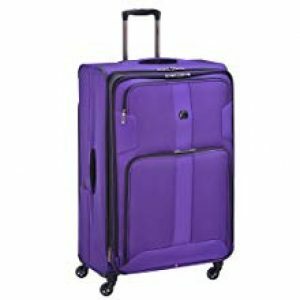 Durable and lightweight with plenty of organization options this spinner luggage is perfect for the well-organized traveler. Why is that? Well, each suitcase in the set features a design that is equipped with three front pockets for maximum organization, as well as a back pocket for storing magazines, travel papers, or even just a jacket. The reason Delsey can fit so much organization into just one suitcase is because these bags are made from lightweight and durable MicroBallistec materials, which even come with a vapor barrier along with corner protectors and skid bars; it’s the perfect marriage of lightweight travel ease with tough protection. Also, another unique design feature is the dual-position upright system which allows travelers to move their luggage with 2- or 4-wheel use, or even carry it using cushioned neoprene top and side carry handles. Included in the set, or available for individual purchase, the design features your standard 22-inch carry-on, 25-inch medium, and 29-inch full suitcase. With full expandability, what you see at a glance is only the half of it. Other suitcases at the same size – take for instance this carry-on that’s part of IT Luggages’ Intrepid Collection – offer a lot of room, but aren’t expandable and therefore don’t maximize as much space for the traveler as they could. For instance, for the business traveler the face-value 22-inch suitcase in this Delsey luggage review offers a minimum of 35 liters; once expanded, however, you could easily fit clothing for a 10-day trip or more (about 40+ liters). 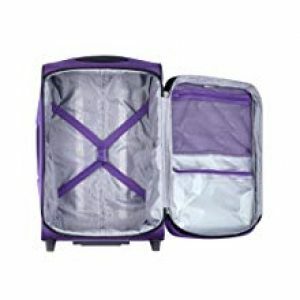 Other storage features include a massive 4 exterior pockets – most suitcases like the comparable Travelpro Tourlite offer a maximum of two outer pockets. Interiors include a zippered mesh pocket located in the ceiling, as well as a liquid-tight zippered pocket for wet or dirty clothing, as well as messy toiletries and makeups. Of course, all suitcases in this collection offer these organization maximizing features with their extra storage; with the medium checked bag coming in with a total of 75+ liters of packing space, while the 29-inch full offers 115+ liters. 9 total pockets are included for exceptional storage: three front pockets for maximum organization, side pocket for water bottle or small accessory, back pocket for magazines, mesh pocket and wet pocket in lid, shoe pockets in main compartment. That’s just one single feature – added organization – and we think it alone will be enough to convince most travelers that the Delsey Sky Max collection is superior to other lightweight designs. Other features include Guardian self-repairing interlocking zippers, durable and cushioned neoprene top and side carry handles, along with an easy to grab bottom handle. The suitcase includes an integrated ID tag for those times your luggage gets lost or misplaced by an airline, and one final unique system is the suitcases dual position trolley which allows travelers to wheel their luggage with 2- or 4-wheel use. When it comes down to urban streets, this last feature is the most important; this is because urban streets can be the hardest on 4 spinner wheels, and can even sometimes lead to the wheels breaking while you’re struggling with your luggage. At 29-inches the full-sized suitcase only weighs 9.6 pounds (unpacked), which is easily 4% lighter than most other full-sized soft-shell suitcases (many of which can weigh up to 11 pounds and make it difficult to keep your luggage weight under the 50-pound maximum). Next in line, the medium suitcase weighs 8 pounds; with the final carry-on coming in at 6.5 pounds. For select airlines you may be able to use the 25-inch suitcase interchangeably as a carry-on, but always check with your airline first. 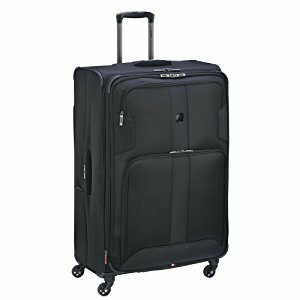 For travelers with age-related health concerns, travelers with back or leg problems, and even just the regular traveler needing to remove luggage safely, the suitcases included in this collection are provided with top and side haul handles which well help you manage a suitcases weight during all point of your travel. 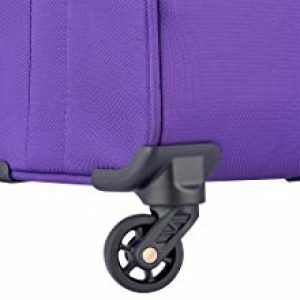 When removing a suitcase from an overhead bin or trolley always try and grip one or both haul handles and remember to lift with your legs rather than your back. These Delsey suitcases are made from a rich blend of micro-fiber ballistic nylon and rank highest on the durability scale where soft shell luggage is concerned. Other suitcases typically employ materials like cotton canvas (medium durability) or polyester (lowest durability); take for instance Pathfinders PX-10 Carry-On Suitcase. This bag is expandable like the Delsey Sky Max Carry-On, it has great interior features, but its materials aren’t nearly as valuable or durable. Additionally, Sky Max bags include a unique vapor resistant lining which provides extra water protection in addition to the interior water tight lining. The design of these bags also features corner bars and skid protectors for added protection, an aircraft grade aluminum handle with an easy push telescopic button, strong side haul handles, and the capability to travel on 2-4 wheels with an advanced suitcase trolley system. Delsey meets expectation in the durability, lightweight, and storage capacity fields, but it is worth noting that this suitcase is somewhat limited in the style section. 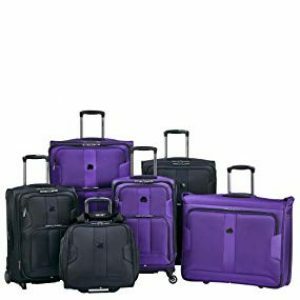 The Sky Max collection offers three basic colors for their suitcases: purple, blue, and black. Each of these colors aren’t too bright or eye-popping, and therefore they are suitable for business formal luggage, but aren’t necessarily your one-of-a-kind original print/designer suitcase. The unique shape and texturing the extra pockets add does somewhat add to the overall style of the design, however at face value the style choices you’re offered are fairly simplistic. Still, these bags make for a great addition to any adventurer, business traveler, or traveler who needs a lot of storage space for their traveling walk-in fashion closet. The carry-on suitcase measures in at 23.25×14.25×10.75 and has been rigorously tested to fit the dimensions of both national and international overhead luggage bins. You’ll never need to cram this carry-on or check it at the gate, and that’s guaranteed to make your travels much easier and much more comfortable. Next is the medium suitcase measuring in at 24.5 x 17 x 10.8 inches, and finally the large checked suitcase at 29.25 x 19.25 x 11.75 inches. 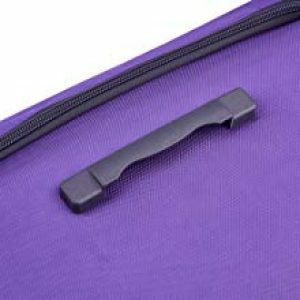 Listed dimensions do not include the additional 2-inches of width when zippered expansions are in use. Also, we cannot stress enough that travelers should purchase luggage based on their needs, and that because of this these suitcases are available separately as well as together in a 3-piece set. Depending on the specific suitcase, DELSEY warrants each product against defects in materials or workmanship for the Warranty Period identified on the product label – typically this is a period of 2, 5, or 10 years from the date of shipment of the product. If a product is repaired or replaced during the Warranty Period, the replacement product or part will be warranted for the remainder of the Warranty Period of the original product. Exclusions include defects from normal wear and tear, damage caused by neglect or misuse, or damages caused by an airlines mishandling. Best Luggage with Full Size Options Comparison and Reviews: Which Is Better for You? 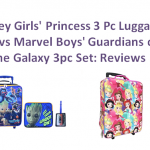 We’ve reviewed select suitcases and suitcase collections from Delsey before, but when it comes to this brands Sky Max Expandable Collection, we are very impressed. Compared to other lightweight soft shell suitcases, this collection offers more storage space with a maximum of nine pockets + 2 extra inches of expandability, these suitcases are more durable and water tight than most other soft shell bags (especially those which use polyester), and for all these extras each bag is fairly affordable (either as a set or on their own). Traveling with all three together any traveler can pack enough for close to a month long (or longer) journey, with extra packing room on the way home; however, if you’re just the business traveler going a weekend away from home, there is nothing better than even the carry-on which offers a maximum of 40+ liters for all your travel needs. Highly expandable and maximizes on packing space with a lightweight nylon stretch design. Constructed of durable micro Ballistic with vapor barrier for long lasting use. Very limited style options for such a cool suitcase. Spinner wheels aren’t as durable as in-line skate wheels.